A federal judge says Hillary Clinton didn't comply with government policies when she used a private server for her email account as secretary of state. U.S. District Judge Emmet Sullivan, in a hearing Thursday for a Freedom of Information Act (FOIA) lawsuit against the State Department, determined Hillary Clinton's server and thumb drive would now be implicated in the many FOIA suits entangled in the larger controversy surrounding Clinton's email system. "We wouldn't be here today if the employee had followed government policy," Sullivan said Thursday, in an apparent reference to Clinton's email protocol. Judge Sullivan ordered the State Department to reach out to the FBI to see if any records related to this FOIA lawsuit may exist on the infamous server and thumb drive now in the possession of federal authorities as part of its "inquiry" into the security of Clinton's email system. Sullivan seemed surprised that the two agencies were not communicating about this already in response to the FOIA request from Judicial Watch. The judge also raised questions about whether the company that maintained her server may have additional copies of her emails. He inferred that he wanted State to ask Clinton whether any third parties might have copies of her emails records, but he did not formally order that in the hearing. The judge's determination comes just as Clinton faces fresh worries in Congress over emails. The Democratic front-runner's campaign has taken steps to defend her against allegations she may have put classified information at risk by using a private email account and server, arguing she never sent or received material considered classified at the time. But Democratic lawmakers said Clinton's campaign has not adequately explained the complicated nature of the email review and panned some of her attempts to use humor to talk about the probe. Clinton joked at a Democratic dinner in Iowa last week that she liked the social media platform Snapchat because the messages disappear by themselves. And she shrugged off questions about her server being wiped clean, asking facetiously in Nevada, "Like a cloth or something?" Is there usable info in Clinton's email server? "I don't think the campaign has handled it very well," Florida Sen. Bill Nelson told The Associated Press on Thursday. "I think the advice to her of making a joke out of it - I think that was not good advice." Nelson said if Clinton had received information that should have been labeled classified or top secret, the person sending the email would bear the responsibility of making that clear on the email. "If she is receiving something on a private email account and it has no designation, then how would she know that it is classified?" he asked. In Republican-leaning Kentucky, Democratic Rep. John Yarmuth warned in an interview with WHAS-TV in Louisville: "I still think there is a chance that this could upend her campaign." The new concerns follow Clinton's decision to turn over her server to federal investigators who are trying to determine if the data on it was secure. Clinton holds a wide but narrowing lead in the Democratic field against Vermont Sen. Bernie Sanders, who has picked up ground on Clinton in New Hampshire and Iowa. Former Maryland Gov. Martin O'Malley has pitched himself as a fresh face and has tried to gain traction. While Clinton holds significant advantages in money and support among Democrats, polls released Thursday by Quinnipiac University in Florida, Ohio and Pennsylvania - three general election battleground states - found that only about one-third of respondents thought she was honest and trustworthy. Other polls suggest public perceptions of her veracity have been declining as she has dealt with questions about her email use and potential mishandling of classified material. That has prompted Clinton's campaign to defend her on cable television and distribute fact sheets to supporters about the inquiry. "We understand there is confusion about the issue and are being more aggressive in making sure people understand two key facts," said Clinton campaign communications director Jennifer Palmieri. 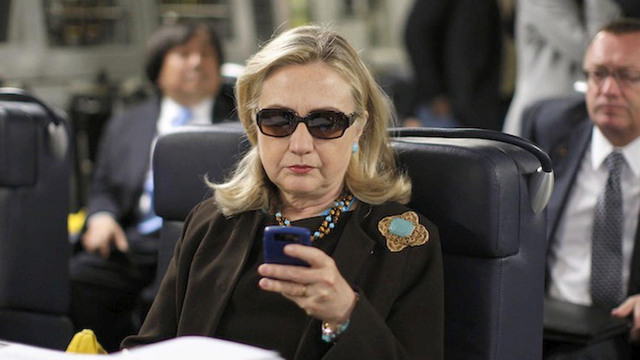 "First, that using personal email was allowed and in keeping with what her predecessors had done. Two, she always treated classified materials with great care, dealt with them in hard copy, not online, and never sent or received material considered classified at the time." Clinton's campaign says she still leads when compared with Republican presidential candidates in hypothetical matchups. And her allies predict congressional Republicans will overplay their hand when Clinton testifies in October before a GOP-led panel investigating the 2012 terrorist attack in Benghazi, Libya. "I've been around this block many times with supposed Clinton scandals. It just won't work," said David Brock, a Clinton loyalist and the founder of Democratic super PAC American Bridge. Clinton told reporters in Nevada that they were the only ones bringing up the subject. But she's mainly been in front of friendly crowds at this stage. And others are hearing about it. In Columbia, South Carolina, on Wednesday, John Podesta, Clinton's campaign chairman, was asked by a supporter how the campaign would defend Clinton against criticism. He said it would deploy people to speak up on her behalf and fight what he sees as political disinformation about the email controversy. "We need to defend her, and we are going to do that," Podesta said. Watching from the sidelines is Vice President Joe Biden, who is considering entering the Democratic primaries. Biden has struggled in two previous presidential bids, but his entry could offer Democrats another alternative. While those in the Democratic field have largely steered clear of the email review, O'Malley said Wednesday in Las Vegas that Clinton's email practices had become a "huge distraction" from what Democrats should be talking about and said it showed the need for more televised debates. "Until we do, our party's label is going to be the latest news du jour about emails and email servers and what Secretary Clinton knew and when she knew it," O'Malley said. Dan Pfeiffer, a former Obama White House adviser, said the focus on her emails "has no doubt put some downward pressure on some of Clinton's attributes." But the real challenge, he said, "is that the email issue is blocking out a lot of the campaign's ability to communicate on topics that matter more to voters." He suggested Clinton would benefit once the election becomes a choice between a single Republican candidate and her. "The question shouldn't be, do you trust Hillary Clinton," Pfeiffer said. "It needs to be, do you trust Hillary Clinton more than Marco Rubio or Donald Trump on the economy, immigration" and more. CBS News correspondent Paula Reid contributed to this report.